Thor (Chris Hemsworth) has some family issues. He and his brother Loki (Tom Hiddleston) are both up for the throne of Asgard currently held by their father Odin (Anthony Hopkins), but of course there is only one seat to be had, leading to some resentment. When Thor is picked by his father, he spoils things at the very last moment by getting warmongery and impulsive and his father banishes him to Earth to learn a lesson. It’s all very Shakespearian and operatic, so it’s fitting the movie was directed by British thesp Kenneth Branagh, known for filming Shakespeare’s plays and who now gets to play around with pop culture. 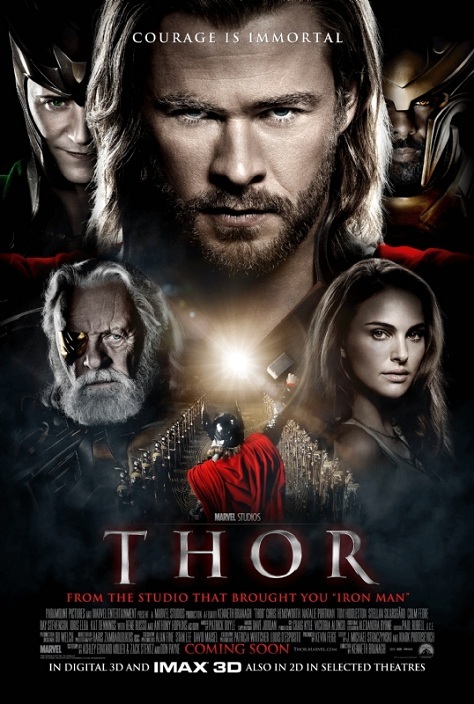 On earth Thor meets a rather hot astronomer (Queen Amidala – aka Natalie Portman) who ends up serving as his guide while lusting after his muscled body. There is much ado about a big, powerful hammer called Mjölnir. Meanwhile Loki – further egged on by an unsettling revelation – takes advantage of Thor’s absence and seizes power. Brotherly strife ensues. Thor is perfectly serviceable entertainment and it serves as a good primer for Thor, who is slated to appear in the upcoming The Avengers movie, directed by Joss Whedon. I saw the movie in 3D and while the fantasy vistas of Asgard look good with depth to them, I have a feeling I wouldn’t have missed much if I saw it in just two dimensions. The movie isn’t without its faults: tension is lacking for one thing. I was never quite sure of the power level of the characters so it seemed anything could potentially happen, making what actually díd happen seem a bit arbitrary. The romantic tension between Thor and Jane is underwhelming and perfunctory; there may be a glowing ember there, but it could have used a lot more fire. Additionally, though the emotional turmoil within Thor’s family is well-handled and played out, the actual fates of Asgard and Jotunheim (don’t ask) that hang in the balance, don’t carry much weight. Despite various shots of a large world, we only meet a few of Asgard’s inhabitants and it seems empty apart from Thor, his family, his four friends and some random people milling about in the background. The potential destruction of icy Jotunheim left me even colder. Pet peeve: There is an extra scene at the end of the credits, leading into the The Avengers movie and guest-starring Samuel L. Jackson as Nick Fury, the leader of SHIELD. I was the only person who knew to hang around for it at the screening I was at, tipped off by a review I read. I understand the business reasons for sticking extra scenes at the end of the credits: it’s a great way to get movie-nerds excited, giving them something people not as in-the-know will miss out on. For people who heard about it too late, it may be an added incentive to get the Blu-Ray, DVD or even to go see the movie a second time. (Especially X-Men Origins: Wolverine tried hard to lure rabid fans back for a second viewing, by having one of two extra teaser scenes stuck to the end of each movie print, making it impossible to not miss out on anything the first time around.) I felt pretty stupid sitting there in my lonesome while the lights came up and the guy who was supposed to start cleaning up hovered impatiently in the back corner of the theater. Yes, the extra scene is fun, but it would have been just as fun spliced into the credits at a third of the way in and a lot more people would have gotten to enjoy it. It seems odd to me that someone who wants ‘the whole experience’ is willfully inconvenienced like this. Temporal nitpick (SPOILER): How come the Vikings knew about Thor and Loki? A picture of the latter flashes by in a book being leafed through. Does time pass a lot slower in Asgard, the centuries flying by on Earth while they grew up just a little more? Or, since they are immortal, are Thor and Loki really old but just kind of immature for their age? And how did the Vikings get to know Loki better than Thor does? In Norse mythology Loki is known as The Trickster while his brother seems to have no clue about his deviousness.